Wow, this book makes such a great summer/beach read! This book is in the gray area of being slightly taboo. Older guy with a much younger girl, they have known each other for many years and she has always had a crush on him. I loved their backstory and getting to see their past and why things have been so acquired between them the past 7 YEARS!!! Yes, you read that right seven years. Adele and Pete haven’t seen each other since she was eighteen and now she is back for her fathers wedding. Adele and Pete have a lot to work out if they want to keep their “friendship” intact. Adele is staying at his house since her father’s house is over run with wedding decor, and neither of them know how to react to each other. Adele wants to put the past behind them and forget the most embarrassing situation she put herself in years go, but Pete seems firm in remaining angry at her. Once walls start to come down feelings, discomfort, and lost friendships start to heal. Adele being the pushy person she is worms her way back into Pete’s heart and shows him what he has been missing out on. Can Adele finally get Pete to see her for more than a friend, to see her as the woman she has become the last 7 years? Oh, the “what if’s” and “should have beens”. How we all wish that we could often right a wrong that has happened in the past. Tanner and Jenna have lots of these questions burdening them over the last ten years. Once they find themselves on set together it’s their one chance to right the wrongs from the past. Jenna is slowly being pushed out of the modeling world, and trying to find a career in her passion…acting. She has always wanted to have a career doing what she truly loved and longed to do. But after years of trying to find an “in” in Hollywood she is about to call it quits when she finally gets that one important call. The call that could change the rest of her life. Tanner is a successful actor making it in the city of lights. His career has him making millions on each film but nothing seems to fill the hole left by the one true passion he once had. Working on this next film is his one shot at getting what he once had back. A shot at the happiness that he wants back. Jenna. Grab DIRTY FILTHY FIX today! This was definitely a hot little read. Laurelin knows how to steam those pages to where I can’t get enough. The characters were smoking hot together and the chemistry with them was so hot it was insane. Another amazing read in the books for Laurelin Paige! WOW! What a series this is turning out to be! I can’t get enough, nor could I put either of the Forbidden Desires books down! To read Dirty Little Promise you HAVE to read Dirty Little Secret, it’s for sure a must. These Kingsley men set the pages on fire and kept me torn between who Emma should choose. At the end of Dirty Little Secret we were left on the edge of a cliffhanger. Thank goodness we didn’t have to wait forever to see what happens between the love triangle that is two Kingsley men and one Emma Bell. Emma needs lots of answers from the brooding, secretive man Gavin. Can she trust him? Will he ever open up to her? Gah! Gavin sure has some explaining to do, and Emma’s heart already knows the answers and what she wants. 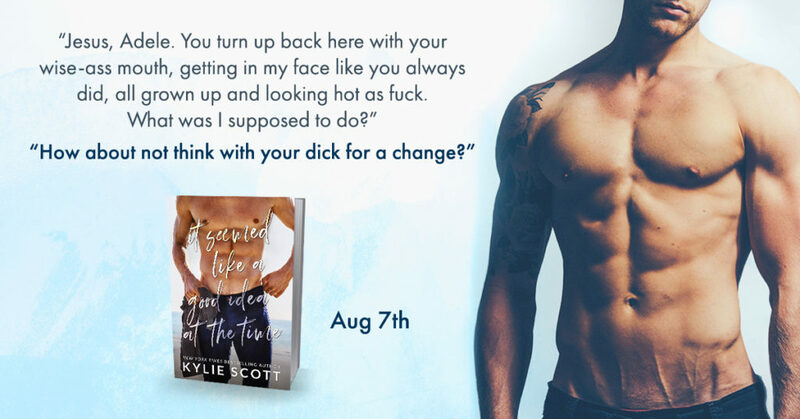 Dirty Little Promise was full of twists and turns, smokin’ hot ripping up the sheets scenes, swoon worthy moments, and just heart felt- heart warming moments. Usually I struggle with second books in series because they generally just aren’t as good as the first book, well I had NO trouble at all with this book. It was every bit as good as the first! Kendall, I have to say I have read lots of your books and this series is by far the BEST to me! I can’t wait to see where you take the Forbidden Desires series next.